In February 2013, Oxfam launched its "Behind the Brands" campaign. The campaign scored the 10 largest food and beverage firms on their policies in seven areas that Oxfam described as "critical to sustainable agricultural production, yet historically neglected by the food and beverage industry." Those are: women, small scale farmers; farm workers; water; land; climate change; and transparency. Some companies responded quickly to Oxfam. Business & Human Rights Resource Centre approached the companies, inviting them to provide a public response to three items from the campaign, to include on our website and in our Weekly Update: the press release, the company scorecard, and the report [PDF]. We said this could be a response already provided to Oxfam, or a new statement. The company responses are below. Blog post by Chris Jochnick of Oxfam America: "Attack? Equivocate? Engage? How big food responds to a tough new campaign"
Oxfam’s Behind the Brands campaign delivers win for women cocoa farmers Mars, Nestle commit to tackle inequality in supply chain, Mondelez yet to follow suit, 27 Mar 2013. 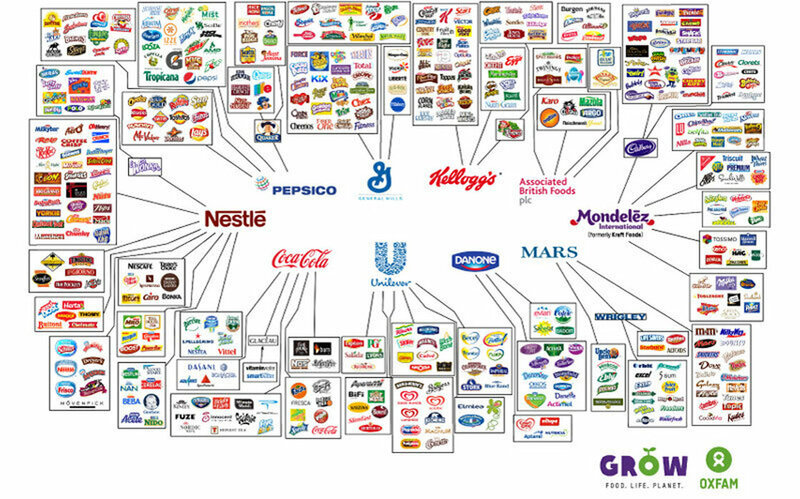 Áreas detalladas: Company responses to Oxfam's campaign: "Behind the Brands - Food Justice and the 'Big 10' Food and Beverage Companies"
Response by Associated British Foods: Oxfam launches campaign: “Behind the Brands - Food Justice and the 'Big 10' Food and Beverage Companies". Response by Coca-Cola: Oxfam launches campaign: “Behind the Brands - Food Justice and the 'Big 10' Food and Beverage Companies". Response by Danone: Oxfam launches campaign: “Behind the Brands - Food Justice and the 'Big 10' Food and Beverage Companies". Response by Mars: Oxfam launches campaign: “Behind the Brands - Food Justice and the 'Big 10' Food and Beverage Companies". Response by PepsiCo: Oxfam launches campaign: “Behind the Brands - Food Justice and the 'Big 10' Food and Beverage Companies". PepsiCo said: "PepsiCo is engaging directly with Oxfam on the important issues raised in the report"
Response by Unilever: Oxfam launches campaign: “Behind the Brands - Food Justice and the 'Big 10' Food and Beverage Companies".